This has something to do with bug #81507. Ubuntu 7.10 activates IPv6 by default and in this case, we need to deactivate IPv6. Look for a line which contains alias net-pf-10 ipv6. Change it to alias net-pf-10 off. This is also related with bug #81507. This may not be a good solution, but you can somehow correctly redirected to archive.ubuntu.com by pinging it before you update. In my case, the update runs smoothly. Other reports that the update runs slowly. To activate compiz, we may or may not need to activate the restricted graphic card drivers. I use ATI Radeon X300 and I’ve managed to activate compiz without using the restricted ATI drivers. Anyway, we need to install compiz. Restart X by pressing Ctrl+Alt+Backspace. 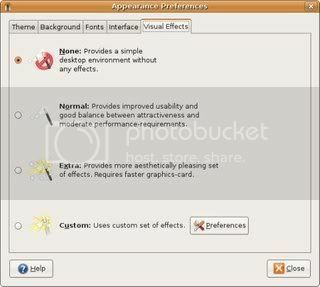 Try to open System/Preferences/Appearance and choose Visual Effects tab. If succeeded you should see four (not just three) different desktop environments. If not, then you need to install the restricted drivers. Open System/Administration/Restricted Drivers Manager. Check to enable the accelerated graphics driver. Restart X. Open the Visual Effects menu again. If you’ve got “The composite extension is not available” message, open X configuration file. Look for a line which contains Option “Composite” “0”. Change it to Option “Composite” “1”. Save changes. Restart X. Open the Visual Effects menu again. This time if you’ve got “Desktop effects could not be enabled” message, then you need to install xserver-xgl. Phew. Now you should be able to see the four choices on the Visual Effects menu. Choose Custom. Click on Preferences. You can play around now with the available options. If you want to the enable the 3D desktop cube, check for Rotate Cube. And don’t forget to set your workspaces to 4 columns and 1 row. 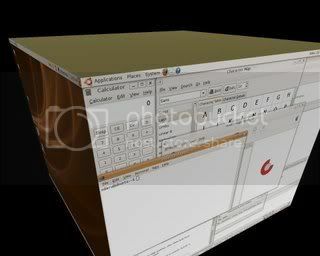 For 3D desktop cube — hold Ctrl+Alt, left click and drag. To switch between tasks, the 3D style — hold the Windows key and press Tab repeatedly. Previous: Ubuntu 7.10, One Linux Distro That Just (not quite) Works! I’m actually in the middle of downloading Slackware 12.0 DVD 🙂 I just want to give it a try as a virtual guest. Hei hei… does the 3D desktop cube originally came from Linux? Cause I’ve seen such as this on windows. It’s a third party however. But is it really useful, or is it just to make the desktop look cool (or rather, confusing)? Can I play movies on each of the screen independently? Actually, compiz can be installed on other Linux distros, not just Ubuntu. Personally I found the cube has no practical purposes other than being cool. I do like the 3D task switching and the window wobbling.